David Brooks, the New York Times‘s supposedly conservative columnist, regularly looks to sports as a way of making sense of our political and popular culture. 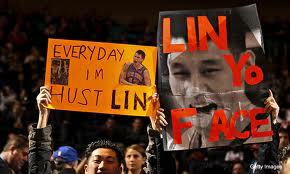 This week he used the Jeremy Lin phenomenon as a pretext for some reflections on the gap between the ethos of sport and the ethos of religion (because Lin, like Tim Tebow, is a devote Christian). For Brooks the gap is a chasm that can probably not be fully or safely bridged. The discussion is relevant for this blog because Brooks claims that the “sporting ethos pervades modern life and shapes how we think about business, academic and political competition.” Our ethical thinking in certain adversarial contexts or institutions will — and ought to — differ from the way we think ethically in other parts of our lives, even if we are deeply religious. Brooks identifies this ethos with “modern sports,” but take away the inclusion of female athletes and ESPN, and the description of the virtues, goals, motivations, and glories of the athletic hero (or warrior) would not have looked out of place in Ancient Greece or Rome. that people have two natures. First, there is “Adam the First,” the part of us that creates, discovers, competes and is involved in building the world. Then, there is “Adam the Second,” the spiritual individual who is awed and humbled by the universe as a spectator and a worshipper. Note that Brooks is focusing almost entirely on one component of a moral or ethical perspective — the part that concerns virtues or characters traits. But we also care about what rights, freedoms, and duties people have; and with the how to design just institutions (which will, in turn, assign various rights and duties to individuals occupying particular roles). So we might also ask whether the rights and duties of “players” in deliberately adversarial institutions will necessarily conflict with the dictates of a religious follower’s conscience. The bolded phrase is the key to understanding the reason we actively encourage a different kind of ethical thinking or ethos in what we are calling deliberately adversarial institutions (like sports, markets, and democratic politics). These institutions regulate a competition in order to create benefits for “non players” outside the competition — what economists call “positive externalities.” So in all of these institutions we deliberately prevent the competitors from cooperating in ways that will be to their advantage but not to the advantage of outsiders. Traditional morality is about cooperating and mutual assistance: adversarial ethics is about how to generate social benefits by preventing certain forms of cooperation; but also about how to make sure that the players use only appropriate tactics in their attempt to succeed. Heath’s article is as good a place as any to see the outlines of, and tensions between, these two features of adversarial ethics. But you should also find these tensions in almost every case study we highlight on this blog. Incidentally, Heath’s article could be of some service to pious, but ferociously competitive athletes like Tim Tebow or Jeremy Lin. They can play hard to beat their opponents, but show self-restraint in doing so by embracing the “spirit of the rules” and by treating their opponents with respect. And of course, they can and should be as cooperative and humble as possible with their own team mates. Within the team itself, there is still no “I” in Golden Rule.